Many Northern California homeowners use a heat pump heating system to leverage the benefits of the mild climate and keep heating and cooling costs low year-round. Spoor's Heating & Air Conditioning has years of experience in repairing, replacing, and installing every type of heat pump system. Our technicians are available 24 hours a day to assist with any emergency repair for your heating and cooling system. Call Spoor’s Heating & Air Conditioning today! Heat pumps pull cold or heat from the air, depending on the chosen system setting, and disperse it within the home through ductwork and air vents. When in heat mode, the heat pump pulls warmth from the outdoor air and transfer it indoors. The process works in reverse — pulling warm air from the home and transferring it outdoors — when in cooling mode. Every type of heat pump relies on four main components for operation — compressor, condenser, expansion valve, and evaporator. Spoor’s Heating & Air Conditioning has the experience necessary for providing reliable repairs for any type of heat pump issue. For professional service from an experienced heat pump heating system company, contact us today! A geothermal heat pump relies on the constant temperature in the Earth’s crust to heat and cool a home. This type of heat pump is significantly more efficient than both air source or water source heat pumps. Geothermal heat pumps may use either a closed or open loop system. Water source heat pumps operate in the same way as air source heat pumps, but pull heat from a body of water, such as a lake or pond, instead of the air. Similar to geothermal heat pumps, water source heat pumps use loop system with the loops installed in the body of water, rather than buried underground as with geothermal heating. Air source heat pumps move air back and forth between the home’s interior and the outdoors. The air moves through coils filled with refrigerant and then moves through a compressor. The air temperature is increased as it moves through the compressor before being distributed through indoor air vents and ductwork. Because these heat pumps rely on the outdoor air to work properly, homes with air source heat pumps usually require a backup heat source. Most issues with a heat pump can be traced back to these three components. Heat pump condensers are generally found outside the home. The issues that can develop with these condensers are similar to air conditioner condenser issues. Debris, such as grass clippings, can pile up on the condenser and hinder how well the heat pump works. Other issues include low refrigerant levels and worn-out defrost control boards. Heat pumps may use programmable or standard thermostats. Either type of thermostat may develop issues with the wiring and/or electrical connections. These issues can affect the heat pump functions. This is why it's important to check the thermostat if you're experiencing heating or cooling issues with a heat pump. If the heat pump itself is fine, but there is still inadequate air flow and uneven indoor heating or cooling, the issue is likely in the ductwork. Leaky, improperly-sized, and/or poorly connected ductwork affect the efficiency of any heat pump. With regular maintenance and heating repairs, most heat pumps can last for an average of 15 years. The process we use during a heat pump maintenance check is similar to the process used to check a standalone air conditioner. Our technicians inspect all electrical connections and controls, the compressor motor, refrigerant coils, and more, including the reversing valve. The reversing valve allows the heat pump to move between heating and cooling. When an issue develops, the reversing valve generally keeps the heat pump in heating mode. Having an 18-inch minimum distance between the outdoor unit and any plants, shrubs, or trees. To schedule an appointment for professional heat pump services, including regular maintenance, contact Spoor’s Heating & Air Conditioning today! Heat pumps can be installed in a home alongside any forced-air heating and cooling system or as a standalone system. Spoor’s Heating & Air Conditioning takes many factors into consideration to properly size a heat pump heating system, including existing ductwork, seasonal changes, and the size of a home. Generally, our technicians can install a heat pump system in one day or less. However, this timeframe can increase if the system is a ductless mini split, which requires more than one unit. The outside unit is installed along an exterior wall then connected to an existing air handler and/or furnace. 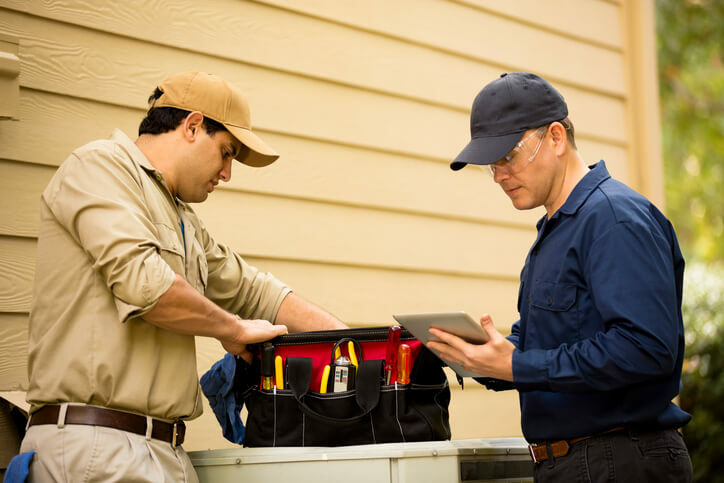 Periodic HVAC tune-ups and maintenance save you money by allowing us to repair potential issues early and making sure the system operates at peak efficiency. Call Spoor’s Heating & Air Conditioning today to schedule a checkup! I can not say enough good things about Spoor's Heating & Air! I not only use them to maintain my system at home but I also use them in my real estate business. They help me inspect and/or repair systems for my clients during crucial times in a real estate transaction. They truly go above and beyond for their customers. I highly recommend them! There honest reasonably priced and have a great work ethic! I can't say enough of how they bend over backwards to help their customers. We recently replaced a heating and air conditioning unit at our rental. Spoor's Heating and Air presented a very reasonable bid for the work with higher end equipment than what their competitors offered. They were extremely timely and professional, both when the old heater needed servicing, as well as installing the new system. The new system had some difficult placement issues and they did an excellent job strategizing the best installation solution. My husband used to install these types of systems (retired). He observed the work, and was extremely pleased with the end result. We highly recommend Spoor's Heating and Air.